POWER FAILURE : A total loss of utility fower. Can be caused by a number of events ; lightning strikes, dwned power lines, grid over demands, accidents and natural disasters. Power faiture can lead to hardware damage, data loss, or total system crashes. POWER SAG : Short-term lo voltage. Triggered by the startup of large loads, utility switching, utility equipment failure, lightning and power service that's too small for the demand. Similar to power failures, sags can damage the hardware. POWER SURGE: ALso known as a Spike. Short-term high votlage above 110% of nominal, surges can be triggered by a rapid reduction in power loads, heavy equipment being turned off, or by utility switching. The results can potentially damage hardware. UNDERVOLTAGE: Also known as a Brownout. Reduced line boltage for extended periods of a few minutes to a few days. Can be caused by an intentional utlity boltage reduction to canserve power during peak demand periods or other heavy loads that exceed supply capacity. Underboltage can lead to equipment failure. OVERVOLTAGE : Increased line boltage for ectended periods of a few minutes to a few days. Can send line boltages to levels in excess of 6.000 bolts. Overvoltage almost always results in data loss or hardware damage. ELECTRICAL LINE NOISE: High frequency waveform caused by RFI or EMI interference. Can be caused by either RFI or EMI intergerence generated by transmitters, welding debices, SCR driven printers, lightning, etc. Introduces glitches and errors into programs/files as well as damaging hardware components. FREQUENCY VARIANTION: A change in frequency stability. Resulting from generator or small co-generation sites being loaded and unloaded. Frequency variation can cause erratic operation, data loss, system crashes and equipment damage. SWITCHING TRANSIENT: Instantaneous underboltage (notch) in the range of nanoseconds. Normal duration is shorter than a spike and generally fall in the rang of nanaoseconds. Can result in quirky computer behavior and puts stress on components which can lead to premature failure. HARMONIC DISTORTION: Distortion of the normal waveform generally. Switch mode power suppplies, bariable speed motors and drives copiers and fax machines are examples of nonlinear loads. Can cause communication errors, overheating and hardware damage. Powerware approach to power protection revolves around the nine most common power problems present in any environment, This unique approach makes your decisions about power protection much simpler. the nine most power problems are: Power failure, Power sags, Power surges, Brownouts, line noise, overvoltage, frequency variation, switching transients and harmonic distortion. These nine power problems are potentially harmful to your valuable data and your computer hardware. Not every UPS protects against all of them. Powerware offers three levels of power protection to choose from: Series 3, Series 5 and Series 9. Each series is designed to fit a different set of power protection needs and allows you to match your needs precisely with the appropriate level of power protection. using the series 3, 5, and 9 approach to power problems, powerware ease your selection process. Powerware series 3 UPSs primarily protect against three of the nine power problems including power failures, power sags and power surges. This basic protection is necessary in order to prevent damage such as data loss, file corruption, flickering lights, hardware damage, and equipment shutoff. For example, if your utility fails you could lose all of your work in progress. Series 3 UPSs offer a degree of protection against other power problems and are most commonly used to protect single workstations. Powerware Series 5 UPSs are most effective against five power problems (power failure, power sags, power surges, undervoltage and overvoltage) and over a degree of protection against other power problems. Some of the damages you risk by not using a Series 5 UPS include premature hardware failure, data loss and corruption, data error, keyboard lockup, storage loss and system lockup. Series 5 UPSs are recommended for small network systems - all the way up to enterprise networking environments. 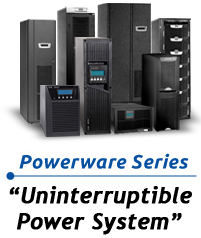 Powerware Series 9 UPSs protect against all nine power problems. Powerware Series 9 comprehensive protection prevents all of the damages mentioned earlier as well as component stress, burned circuit boards, data crash and program failures, Series 9 UPSs offer the highest level of power protection available and are always recommended for mission-critical applications like business dependent server farms and hospital. Even in the United States, where power quality is relatively good, a typical computer installation experiences each year an average of 289 power disturbances potentially harmful to sensitive electronic devices. This is the documented conclusion of a five-year study by the Best Power National Power Laboratory, dedicated to learning more about the nature and incidence of power quality problems. The study monitored over 130 sites throughout North America. "Disturbance" was defined any power aberration outside the recognized susceptibility limits for computer equipment, as established by the Computer and Business Equipment Manufacturer's Association (CBEMA). 164 Surges/Overvoltages, usually caused by drops in electrical demand and widespread equipment shutdown. 90 Sags/Undervoltages, caused by large loads starting up, line faults in utility power, or rolling brownouts created by utility companies on peak-use days. 19 Transients or Spikes, most caused by lightning, some by power coming back on after a blackout.